These batteries also work effectively with other UPS. With a capacity of 180Ah C20 at 27℃, these batteries offer backup that varies from three hours to fifty four hours depending on the connected load. With a length of 505mm, width of 190mm and height of 415mm, these batteries have a filled weight of 60Kg and their gross weight is 62Kg. These batteries can hold 20 litres of acid, more or less. These batteries come packed in multi colored cartons. While there is the standard warranty of 36months, prorated warranty of 18months is also available. These are low maintenance batteries designed to provide up to 40% extra backup. 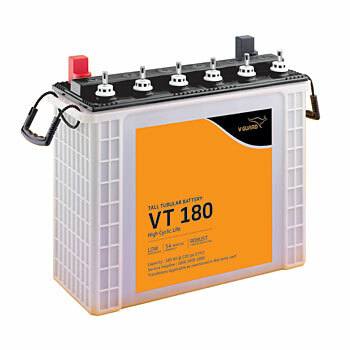 V-Guard uses innovative alloy to cast the spines and grids of these batteries. To ensure long and reliable service, thick and modified tubular positive plates are used in these batteries. These batteries also require less topping up from the date of sale. These batteries are designed to ensure low rate of self discharge. These batteries have excellent cycle life. Refer our buying guide to choose the right model.